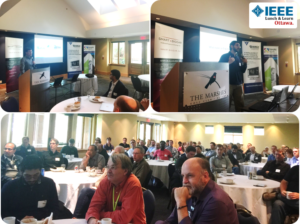 On September 5th, John Clarke of General Dynamics Mission Systems Canada discussed innovation in the area of Data Centric Intelligence, Surveillance and Reconnaissance Applications. Highlighted was technology aboard the CP-140 Aurora and how machine learning is being used to aid the small crew aboard. Posted by Rishi Sharma on 2017-09-29 at 21:28 in News.